Steroid injections, also commonly referred to as cortisone shots, are injections of corticosteroid drugs. The steroid injection can be administered as a localized injection (e.g., intra-articular) or into a muscle (buttocks, for example) or vein for a systemic effect (i.e., whole body). Corticosteroids are synthetic drugs which closely resemble cortisol, a hormone naturally produced by the adrenal glands. By injecting, your doctor can deliver a high dose of corticosteroid medication directly to a painful area of the body for the purpose of decreasing inflammation by reducing immune system activity. Corticosteroids are used to control inflammation in arthritis and other inflammatory conditions. Corticosteroids can be injected directly into inflamed tissues, or they can be delivered to the whole body via oral preparations, intravenous injections, or intramuscular injections. Steroid injections may provide significant relief to patients with arthritis or musculoskeletal conditions. For patients with rheumatoid arthritis, the injections are typically offered when only one or two joints display active synovitis. The goal of treatment is to quell symptoms of a flare or to enable slower-acting drugs, such as methotrexate or Plaquenil, time to work. For example, in early rheumatoid arthritis, study results revealed that a combination of DMARDs and intra-articular steroids is significantly better than DMARDs alone. The knee is a common joint that is injected. It is recommended that patients limit their weightbearing activity for 1 - 2 days after an injection to give it the best chance to be effective. Overuse in the first 6 hours after injection can actually aggravate arthritis. Since a local anesthetic is typically combined with the steroid, patients may be unaware that they are putting too much stress on their arthritic joint, as the pain is masked, according to rheumatologist Scott J. Zashin. Recommendations vary, but most physicians will avoid injecting a single joint more than 3 times in a year. For example, you can have your left knee injected two times a year and your right knee injected two times, but not 4 times on the same side. An excessive number or frequency of steroid injections can cause bone, ligament, or tendon damage. There are several options for the steroid drug that is used in an injection. Largely, it depends on the doctors preference (e.g., Depo-Medrol [methylprednisolone acetate], Aristospan [triamcinolone hexacetonide], Kenalog [triamcinolone acetonide] and Celestone [betamethasone]). While patients often feel better immediately in the exam room, once the local anesthetic wears off, it may take up to 10 days to realize that benefit again. Local steroid injection into the muscle (buttocks) provides a systemic effect. If a specific joint is involved, the steroid injection into the buttocks is likely less effective than an intra-articular injection. As with oral corticosteroids, it is uncertain how much of the systemic medication reaches the specific joint. Also, if the injection into the buttocks is repeated frequently, it can increase the risk of developing some of the common adverse effects experienced with oral steroids, including osteoporosis and cataracts. Generally, local steroid injections are well-tolerated and less likely to be associated with serious side effects compared to oral corticosteroids. Steroids should not be injected if there is an infection at the site that is to be injected or anywhere in the body. If the affected joint is severely damaged, there is less likelihood for a good outcome with a steroid injection. 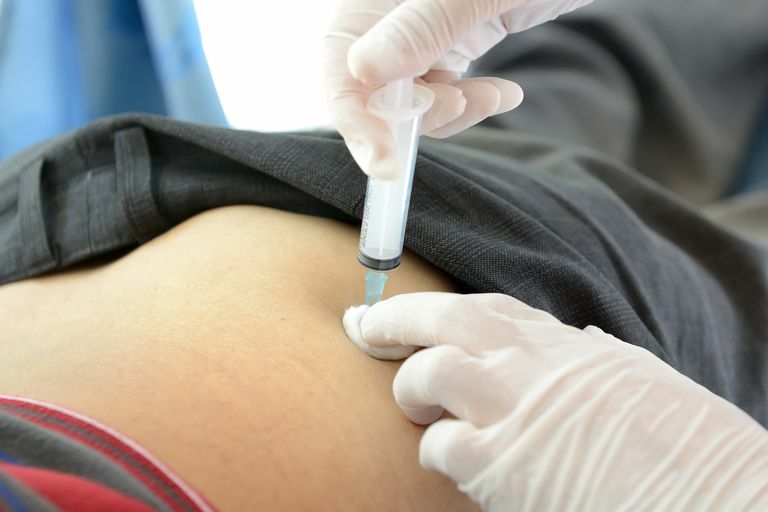 Typically, it is protocol to aspirate joint fluid for testing purposes before injecting a joint with steroids, especially if the diagnosis is still uncertain. Comparison of intra-articular glucocorticoid injections with DMARDs versus DMARDs alone in rheumatoid arthritis. Journal of the Association of Physicians of India. Menon N. et al. August 2014. Kelley's Textbook of Rheumatology. Ninth edition. Elsevier. Glucocorticoid Therapy. Chapter 60.